Well, today I get to share a little secret I've been keeping from ya'll. I've just been bursting at the seams and it's been so hard not to just spill it!! Right close to a month ago, I received an email from one of those "upper echelon" stamper girls (ya'll know the ones). You may know her and I'm sure you've at least heard of her--Anna Wight, illustrator, photographer, cardmaker, chicken lover and Irish Dexter cattle raiser extraodinaire. She wanted to know if I'd be interested in filling a Featured Designer spot for Whipper Snapper Designs. GULP! (Be still my cholesterol laden heart! On second though, don't.) Of course I more than willingly agreed to do so! How I was even on her radar is beyond me and it's a complete honor to help her introduce her newest stamps that are being released today. There are two new stamps sets coming your way--a ca-ute little cowgirl set called "Cowgirl Up!" (which of course has some cute chickens included in it) and then this one called "Halloween Fun". I chose to work with the Halloween one first, as it was going to make for a refreshing break from the summer cards I've been doing and give ya'll something a little different for the time being as well! I love the "folksy" feel to Anna's designs and thought it would be a perfect opportunity to bring back a few of my old techniques and supplies I hadn't used in a while. How long's it been since you've made little stitching marks around your images or used tiny and narrow gingham ribbon? I've always loved them both, but sometimes they just aren't fitting for certain cards. 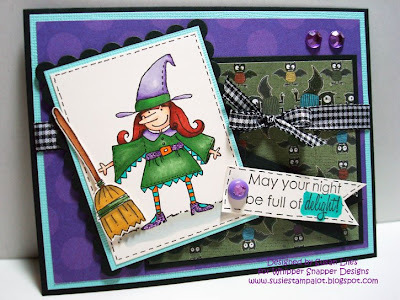 I think both are just the right touch for this cute little witch and her sparkly purple shoes and matching belt. The bling definitely delights her! Anyway, I hope ya'll are excited that I'll be gracing your presence with a few more Whipper Snapper cards for the rest of July and then also in August. I have several friends who I get to share this distinguished title with and they are: Leigh O'Brien, Lisa Kind, Heather Pulvirenti, Kim O'Rosky and of course, sweet Miss Anna. You can also check out all the Whipper Snapper Featured Designer samples in the WSFD gallery on Splitcoast. SUSIE Q-TIP: It's OK to mix ribbon widths on your card. I did it on this one and no one got hurt. WOW! Congrats! I love Anna and her quirky cards. Love this card! Congrats on being Guest Designer, you must be so chuffed!! This is a really cute card, and it showcases the stamp beautifully! Congrats on being selected as a featured designer! Love the card! Really cute card, Susie! (love your blog name, btw!) Congrats on the FD nod...it's going to be a fun 2 months! Big congrats, Sus! Love your card! This is fabulous Susan! Love the colours! CONGRATS girlie!! I am LOVING the new sets!! You go girl! !